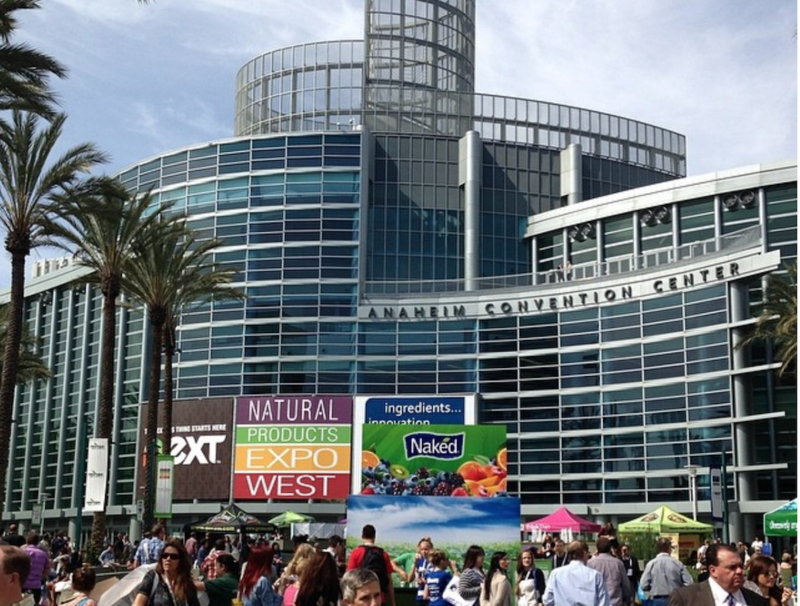 The 2018 Natural Products Expo West was the largest Expo to date. There were a total of 3,521 companies that exhibited, including over 600 businesses at the Expo for the first time. The Expo was able to take advantage of the Anaheim Convention Center‘s newly expanded North Halls as they had finally completed construction. The North Halls consisted of over 800 exhibitors, many that were newer to the natural products world. For me, it was the first year I attended all four days of the Expo West. 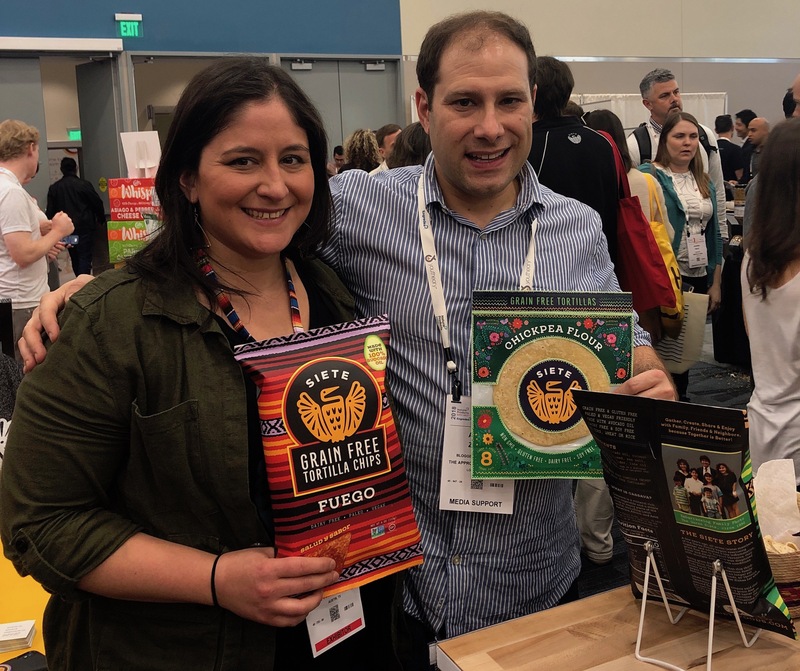 In that time, I had a great opportunity to learn more about the trends of real food, discover both new companies and new products by existing companies. Last week, I wrote about the trend of prepared meals that use only real ingredients. Here now are my 10 other favorite discoveries. Pork rinds always sounded gross to me. But at last year’s Expo, when I saw that the 4505 Chicharrones were Paleo Certified and humanely raised without add antibiotics or hormones, I felt I should give them a try. And I instantly became a fan. Now I’m kind of sad I didn’t try them when I was younger. Or maybe not since the ones in my childhood use factory farmed pork. 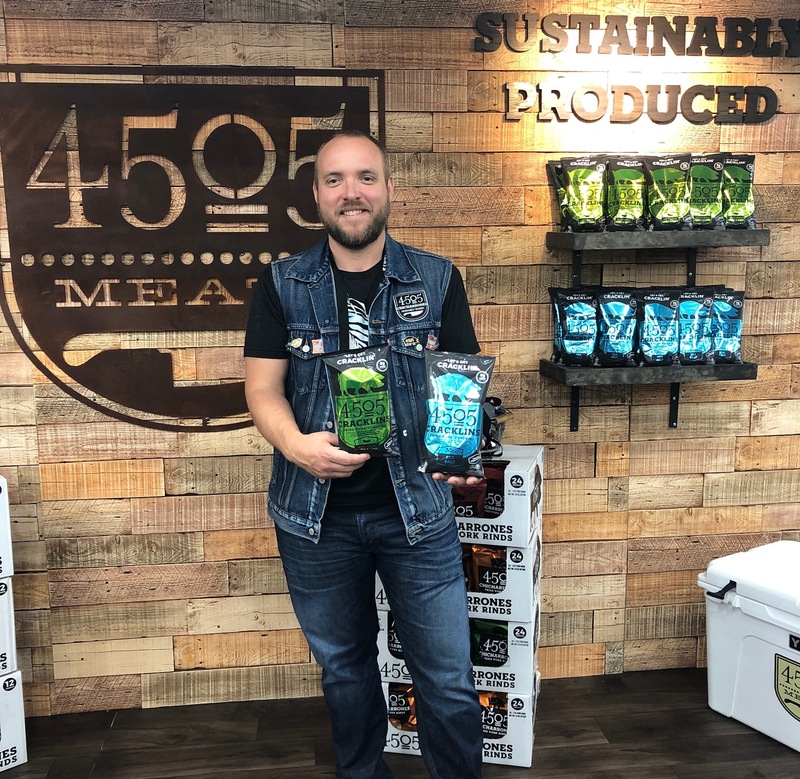 4505 was founded by Ryan Farr (pictured above) as a whole animal meat company. This year Ryan introduced Cracklins, which are similar to the pork rinds except use pork fat with skins. As I’m a big advocate of eating every part of the animal, including the fat and skin, this makes a product for an omnivore very appropriate. Along with sustainable meats, ferments are another subcategory of real food that I’m passionate about. And one of my favorite ferments is kombucha. I’ve recorded many podcasts about this wonderful beverage. 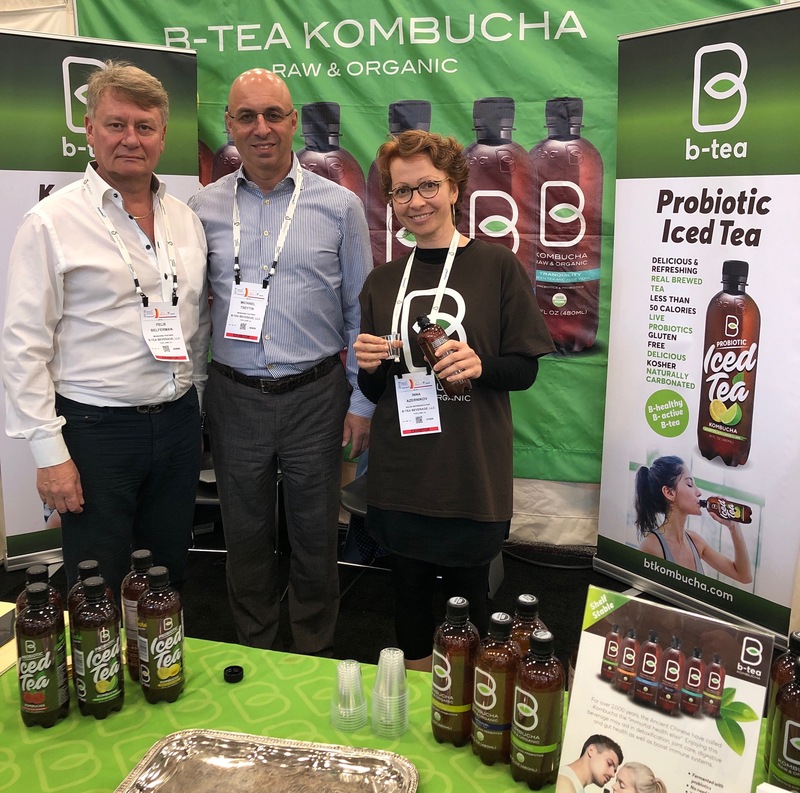 B-Tea Kombucha is unique to the ever expanding kombucha market as it’s shelf stable. They have a number of flavors using different types of tea, including black tea, green tea, chamomile, and aloe vera. They’re also introducing a few varieties of kombucha which they’re marketing as iced tea. Every year at the Expo, there’s a new popsicle company. 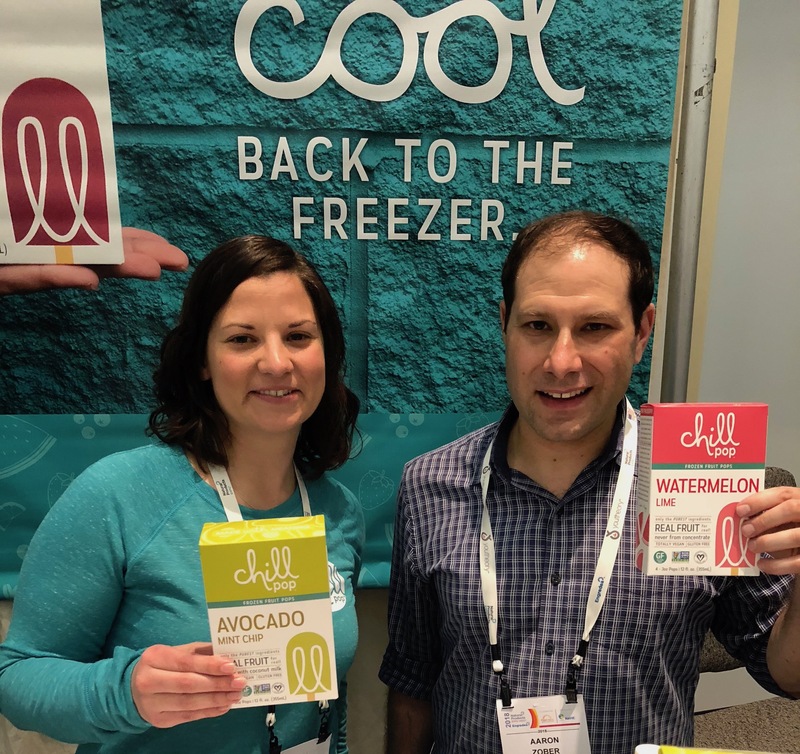 These are popsicles that use real fruit, sometimes also include vegetables, and avoid using artificial dyes, high fructose corn syrup and other chemically derived ingredients. Chill Pop has a number of flavors mixing together fruits and vegetables, avocado mint chip, cucumber kiwi, and blueberry basil. And their sea salt strawberry and lemon ricotta use a grass fed cream. Plus Chill Pop is based out of Cleveland, OH, where I grew up. Always great to see companies from my hometown thriving. Field Trip now has its feet in several worlds of sustainable meat snacks that are continually increasing in popularity. They’ve been another excellent choice in the grass fed beef jerky and grass fed beef stick makers. 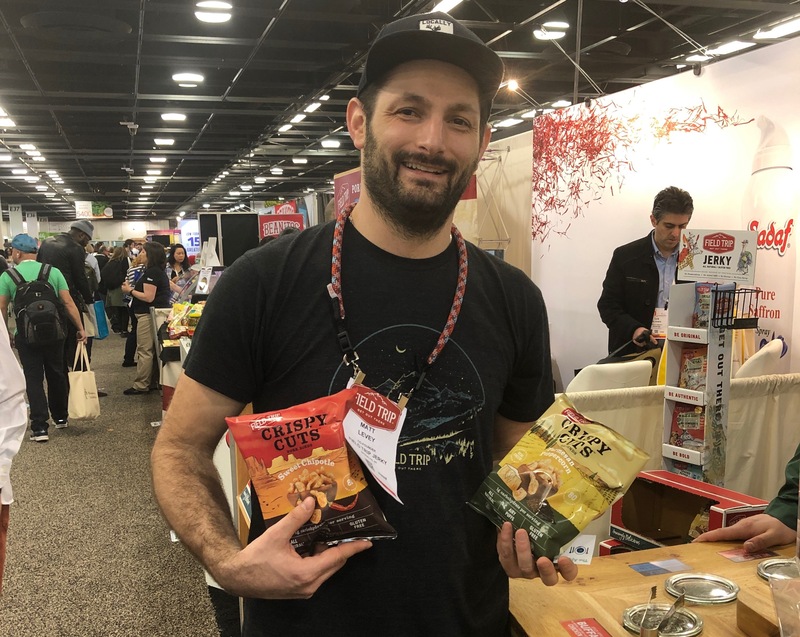 At this year’s Expo West, they introduced their crispy cuts, which are their entry into real pork rinds. As I noticed few exhibitors at the Expo making natural pork rinds, I must not be the only one now addicted to them. Jackson’s Honest has always been a favorite of mine. I discovered them right at their beginning during the 2012 Wise Traditions Conference and soon interviewed founder Megan Reamer on my podcast. Jackson’s began as the first coconut oil potato chips. They then expanded into making coconut oil tortilla chips. 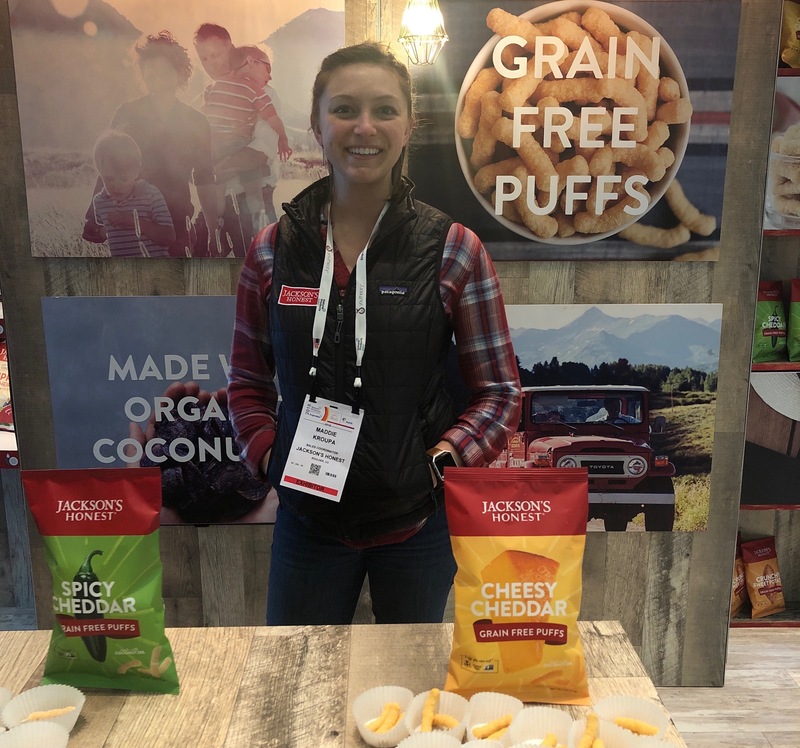 And their grain free puffs were launched at the Expo West. Jackson’s Honest’s puffs not only use coconut oil over the rancid canola and soybean oils, but are also both gluten and grain free. Their puffs are made from a cassava flour. Cassava is one of the fastest emerging grain free flours. It has the pros of being free of any grains or nuts. It also is the most similar to wheat flour. And it comes from the yucca, a root vegetable high in fiber. Two of the three varieties of the Jackson’s Honest puff are a take on the popular cheese puffs, using an organic cheddar. The other is a dairy free option with a sweet potato flavor. I was introduced to Parker’s Real Maple, by Jason Jones (pictured above). 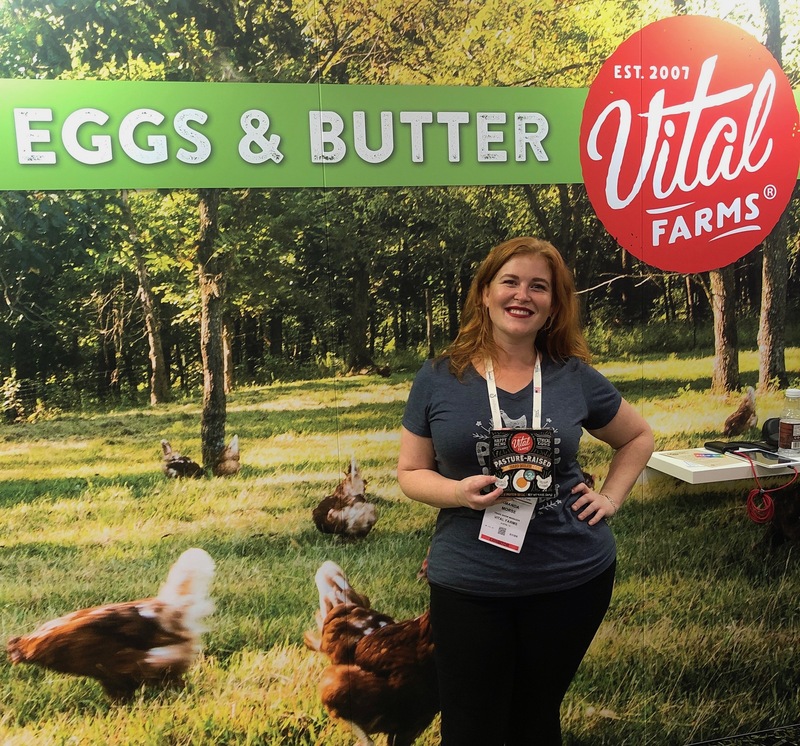 I first met Jason back in 2012 when visiting the booth for the amazing Vital Farms eggs. I’ve gotten to know him over the years, interviewing him twice on my podcast for Vital Farms. 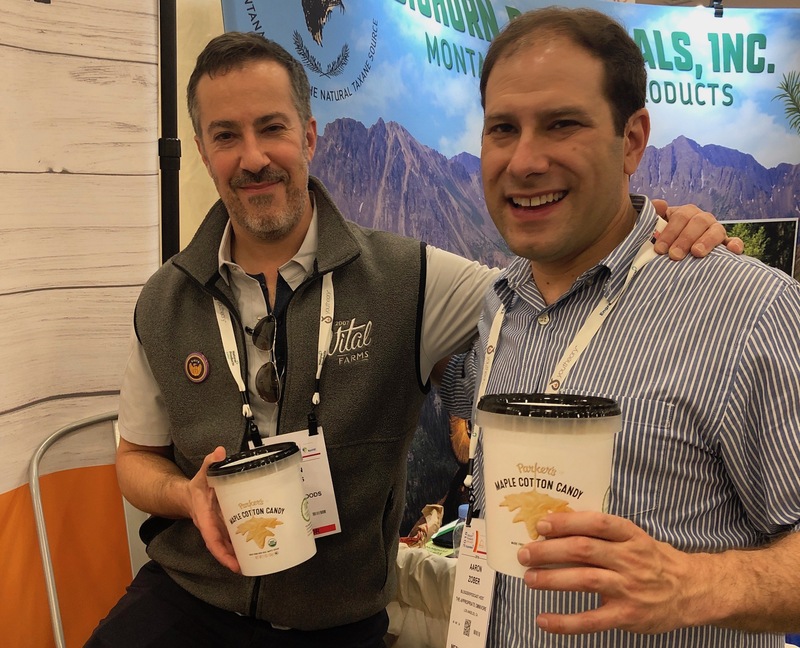 As I’ve seen Jason at the Expo the past couple years, I’ve gotten to learn about the various natural product brands he’s been consulting with, such as Heavenly Organics and Tin Star Foods. And Parker’s Real Maple. Growing up in Ohio, I always loved going to the maple farm and gorging on some maple candy. But maple syrup isn’t just tasty. When in its pure form, it’s a great natural sweetener which comes directly from the sap of a maple tree. Unfortunately, so much of the maple syrup you find at conventional supermarkets is filled with junk like high fructose corn syrup and other chemical ingredients. As the “Real Maple” in their name implies, Parker’s is a great choice for getting pure maple syrup. They also have a cotton candy made from simply maple and cane sugar. It was fun getting to sample their cotton candy. Another throwback to my childhood. Only Parker’s cotton candy is free of any genetically modified sugar and artificial food coloring. Siete was a company that I first discovered at the end of last year. I’ve often seen people bring their grain free tortilla chips to my Weston A. Price Chapter‘s potlucks. As I’ve covered these events on my Instagram page, I’ve often received comments from others about how they love Siete. As I Instagrammed the Expo West live, no post received more likes or comments than my photo with Siete founder and CEO Veronica Garza. It was with great pleasure to meet her and tell her how much myself and people I know love her products. I also got to sample their new grain free tortillas. There are a number of options in terms of flours for their tortillas. They offer ones from almond flour, cassava, and now chickpea flour. A couple years ago, I gave a presentation to my Weston A. Price Pasadena Chapter about candy and avoiding refined sugars. At the time, my emphasis was on homemade candy as there was maybe one candy on the market using a natural sweetener. Since then, the numbers are steadily growing. In addition to natural sweeteners, my other major point in the presentation was about the health benefits of gummy candy. Gummy candy contains gelatin, which is great for your skin, digestive tract, immune system, heart and muscles. 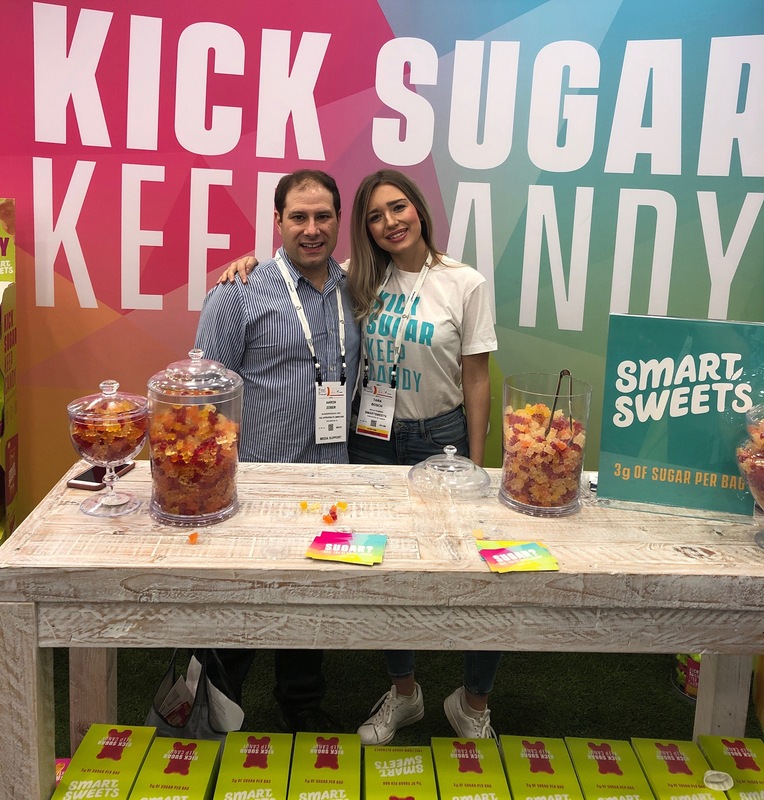 Smart Sweets CEO and founder Tara Bosch shares my views. She makes a candy that uses stevia and grass fed gelatin. It doesn’t use any sugar alcohols or artificial sweeteners. Smart Sweets also uses real fruit and vegetable juice for its colorings. Their two varieties are sour and fruity gummy bears. I’ve always loved sour candy. It’s so awesome to have a sour candy that comes from real food. Union founder Zubin Mehta is another person who shares the beliefs of The Appropriate Omnivore. 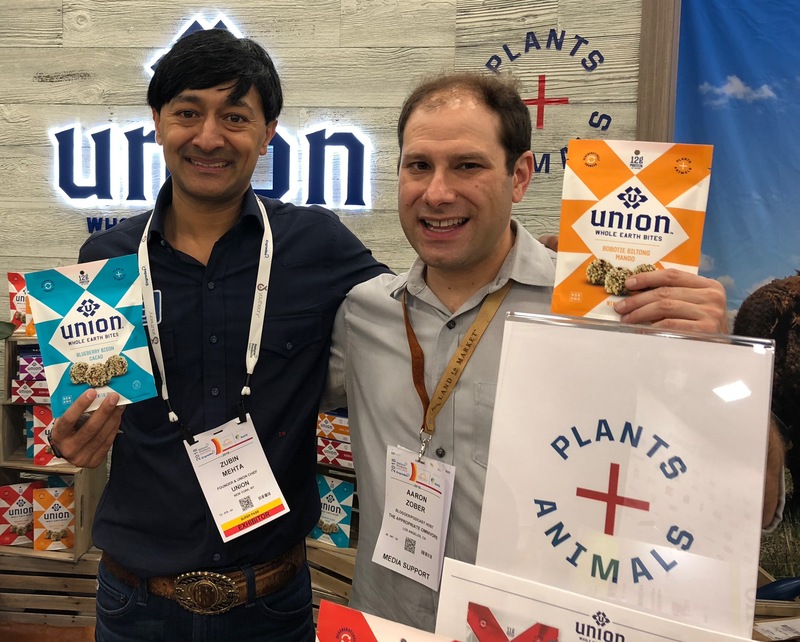 As The Appropriate Omnivore is all about eating both properly sourced plants and animals, this exhibitor describes their products as a union of plant and animals. Union asks “Why should you sacrifice veggie deliciousness or protein power when you can experience the best of both?” So Union makes balls and bars containing meat mixed fruit and/or vegetables. Union is also taking part in the Savory Institute‘s Land to Market program, which is all about regenerating our grasslands in terms of soil health, biodiversity, and ecosystem functions. I love that it says “regeneratively sourced” on their packages. As I mentioned above, Vital Farms is a longtime favorite of mine. In fact, they’re the only eggs available in the supermarket which I recommend buying. Since first seeing them at Expo West six years ago, the company has grown quite a bit. Vital Farms now can be found at a wider variety of supermarkets. They began offering a grass fed butter a few years ago. And now they make hard boiled eggs. There are many ready made hard boiled eggs on the market, but none are from pastured chickens. While I often boil the eggs myself, packaged hard boiled eggs are a great option when I wake up and need to leave in a hurray.